In this Article I will try to give some insight on how to memorize PMP processes, and how to relate them to the correspondent Process Group, and Knowledge Area. 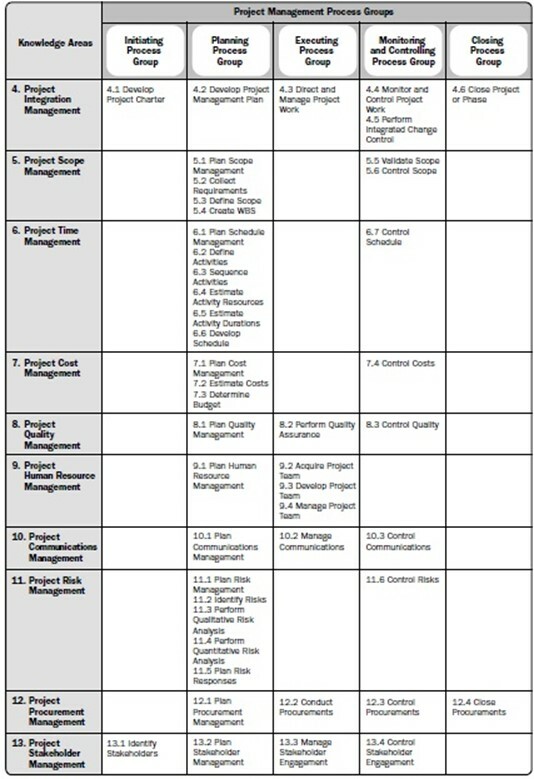 We will be using the famous Project Management Process Groups and Knowledge Areas Mapping table from PMBOK guide, which is shown below, to demonstrate how we can easily relate the process to its Process Group and Knowledge Area. So what is the easiest way we can use to relate each process to its process group? It’s very obvious that Initiating & Closing process groups are not the ones that causing confusion here, since both of them has 4 processes in total, which leaves us with three Process Groups to focus on. You don’t have to memorize the 47 processes names; you just want to focus on some flash words, such as “Plan“, “Estimate“, “Perform“, “Develop“, “Control“, and “Validate“. Will discuss each one of them below. Develop Project Management Plan: Integration Management Knowledge Area. Plan Scope Management: Scope Management Knowledge Area. Plan Schedule Management: Time Management Knowledge Area. Plan Cost Management: Cost Management Knowledge Area. Plan Quality Management: Quality Management Knowledge Area. Plan Human Resource Management: Human Resource Management Knowledge Area. Plan Communication Management: Communication Management Knowledge Area. Plan Risk Management: Risk Management Knowledge Area. Plan Risk Responses: Risk Management Knowledge Area. Plan Procurement: Procurement Management Knowledge Area. Plan Stakeholder Management: Stakeholder Management Knowledge Area. All of the mentioned above processes belongs to the Planning Process Group, so if there is any question stating that you are in a process that has “plan” word, and then asks what you should do next, you should know that you are in the Planning phase of the project. Estimate Activity Resources: Time Management Knowledge Area. Estimate Activity Duration: Time Management Knowledge Area. Estimate Costs: Cost Management Knowledge Area. All of the mentioned above processes belongs to the Planning Process Group. Perform Integrated Change Control: Integration Management Knowledge Area. Perform Quality Assurance: Quality Management Knowledge Area. Perform Qualitative Risk Analysis: Risk Management Knowledge Area. Perform Quantitative Risk Analysis: Risk Management Knowledge Area. The first one belongs to Monitoring & Controlling Process Group and that because it has the“Control” word, “Perform Quality Assurance” goes under Executing Process Group, and the last two belongs to the Planning Process Group. Develop Project Charter: Integration Management Knowledge Area. Develop Schedule: Time Management Knowledge Area. Develop Project Team: Human Resource Management Knowledge Area. All of the mentioned above processes belong to the Planning Process Group, except for the “Develop Project Team” belongs to Executing Process Group, and “Develop Project Charter” it belongs to Initiating Process Group. Monitor & Control Project Work: Integration Management Knowledge Area. Control Scope: Scope Management Knowledge Area. Control Schedule: Time Management Knowledge Area. Control Costs: Cost Management Knowledge Area. Control Quality: Quality Management Knowledge Area. Control Communications: Communications Management Knowledge Area. Control Risks: Risk Management Knowledge Area. Control Procurements: Procurement Management Knowledge Area. Control Stakeholder Engagement: Stakeholder Management Knowledge Area. All of the mentioned above processes belong to the Monitoring & Controlling Process Group, the good news that 10 of 11 processes in the Monitoring & Controlling has the word “Control“ 🙂. Validate Scope: Scope Management Knowledge Area, this process belongs to Monitoring & Controlling Process Group. So the advice here is you don’t have to memorize all and every process and in which Process Group and Knowledge Area it belongs, you need to focus on the flash words, as mentioned above. I hope you will find this post useful and it can help you in passing your PMP exam. Fibre Channel over IP bundles Fibre Channel frames into IP packets and can be a cost-sensitive solution to link remote fabrics where no dark fibre exists between sites. What is FCIP, and what is it used for? Fibre Channel over IP, or FCIP, is a tunnelling protocol used to connect Fibre Channel (FC) switches over an IP network, enabling interconnection of remote locations. From the fabric view, an FCIP link is an inter-switch link (ISL) that transports FC control and data frames between switches. Where two sites are connected by existing IP-based networks but not dark fibre. Where IP networking is preferred because of cost or the distance exceeds the FC limit of 500 kilometres. Where the duration or lead time of the requirement does not enable dark fibre to be installed. FCIP ISLs have inherent performance, reliability, data integrity and manageability limitations compared with native FC ISLs. Reliability measured in percentage of uptime is on average higher for SAN fabrics than for IP networks. Network delays and packet loss may create bottlenecks in IP networks. FCIP troubleshooting and performance analysis requires evaluating the whole data path from FC fabric, IP LAN and WAN networks, which can make it more complex to manage than other extension options. Protocol conversion from FC to FCIP can impact the performance that is achieved, unless the IP LAN and WAN are optimally configured, and large FC frames are likely to fragment into two Ethernet packets. The defaultmaximum transfer unit (MTU) size for Ethernet is 1,500 bytes, and the maximum Fibre Channel frame size is 2,172 byes, including FC headers. So, a review of the IP network’s support of jumbo frames is important if sustained gigabit throughput is required. To determine the optimum MTU size for the network, you should review IP WAN header overheads for network resources such as the VPN and MPLS. FCIP is typically deployed for long-haul applications that are not business-critical and do not need especially high performance. Remote data asynchronous replication to a secondary site. Centralised SAN backup and archiving, although tape writes can fail if packets are dropped. Data migration between sites, as part of a data centre migration or consolidation project. Alleviate the pain points for IT upgrades, consolidation or mergers with this 10-step data center migration checklist. Major IT changes are inevitable, but businesses can mitigate their inherent risk by following a proper data center migration checklist. Data centers consist of complicated, densely populated racks of hardware running all kinds of software, connected by oodles of cabling. So, when the firm plans to migrate an application, a business group or perhaps the entire IT infrastructure to a new platform, it can cause a panic. A migration means sifting through the complex web of connected devices, applications, cooling systems and cables to map out all interdependencies, then planning and executing on a data center migration project plan with minimal disruptions. Here is a data center migration checklist in 10 easy steps. Businesses have different reasons for migrating to a new system, and those motives alter the potential challenges IT will face during migration. Perhaps market success caused explosive growth that rendered the current data center facility obsolete: More processing power is needed. Perhaps the company wants to save costs: Data center consolidation and right-sizing by combining systems will lower licensing and operational expenses. Mergers and acquisitions often drive a data center migration project: The two groups must become one cohesive organization. Regulatory requirements also spark change: A corporation will revamp its data center to shore up backup, archiving, data management and security. The success or failure of a migration project depends on how well the IT department completes its due diligence. Ask the right questions long before you touch any data center system. “Generally, companies start 18 months ahead,” said Tim Schutt, vice president at Transitional Data Services (TDS), a technology consulting company based in Westborough, Mass. Create a data center migration project plan that identifies the steps in the process, as well as the key resources needed. Define the scope and size of the project, and then examine key limiting factors, such as system availability and security. Set a migration budget and get the organization’s approval. Finally, account for future system requirements, and leave enough capacity in the new systems to support future growth. How will the change affect other departments within the organization? Individual stakeholders view the data center migration uniquely because they concentrate only on how a move affects their daily operations. The CFO views the project as a cost cutter. The data center manager perceives it as a logistical nightmare — one giant, multiyear checklist of actions with hazards lurking everywhere. The systems administrators view it as a technical challenge. The business units might envision outages that will threaten their performance. First, it is incumbent on the data center manager to understand those different viewpoints within and outside the IT team. Spend time in the various departments. Early in the process, make these employees aware of the changes that are coming. As the migration unfolds, pull in different departments’ executives for planning; make sure their voice is heard. This will encourage non-IT personnel to support the project and work with your team to solve any problems. IT departments often support systems that aren’t officially on the books; data center resources enter the organization through the front and back doors. Before beginning a migration project, the IT shop must identify all of its components. That means — especially in larger companies — finding servers hidden under employees’ desks and applications that have been running in departmental stealth mode for years. Identify all the hardware, software, network equipment, storage devices, air and cooling systems, power equipment, and data involved in the move. Then pinpoint the location of each of these data center elements, determine where each will move and estimate how long that process will take. Businesses today are intolerant of long service disruptions, aka downtime. Everyone expects their systems to be available 24/7. But saying you can’t afford downtime isn’t the same as saying you can afford uptime. Keeping systems up during a migration adds to the project’s cost. To truly eliminate any downtime, you would need a duplicate data center, which is not practical. IT needs to work with business units to identify times to take department and company applications offline. If they look closely enough, departments can find windows when the migration would least hinder their operation. “[For example,] a department may have a backup window when their systems are down,” TDS’ Schutt explained. Problems will arise during the migration, and they will influence system availability. The challenge is to figure out the data center migration risks ahead of time, and determine how they will affect the company’s plans and which steps can lessen their impact. The success or failure of contingency plans stem from the strength or weakness of the initial audit. For example, if a firm has a complete picture of its local and wireless area networks, the IT team knows where to place backup communication lines to keep information flowing despite downtime on a major circuit. Include interim equipment and backup systems in the contingency plan wherever necessary. Determine ahead of time how much the business is willing to spend on such devices and what will happen with them after the data center migration. Ideally, the extras will become part of the IT device pool and get used as various components age out or break down. IT departments often have a broad understanding about what needs to happen in a data center migration project. Unfortunately, they slip up on the little things. Employees get sick — some will be out during the move. Do you have the staffing levels to continue the project? Equipment will be damaged during the move. Do you have spares? Do you have the right packing supplies for delicate items? When data storage supplier Carbonite Inc. moved its data center, it even made allowances for the traffic in Boston. “Traffic can get quite heavy during certain times,” said Brion L’Heureux, director of data center operations. The company worked with law enforcement to avoid traffic jams and accidents as equipment moved from one location to the other. Even the most fastidious planners cannot account for every possible obstacle. During its move, Carbonite’s fire alarm sounded, which left the staff out on the sidewalk. Factoring in some unexpected snags like these allowed the company to complete the migration on schedule. Data center migrations typically occur in stages. First, the new system is deployed and tested. The data center staff verifies that the servers, racks, power circuits and storage all operate. Then, network connections are installed and tested. And finally, the IT team tests its backup systems and the change is made. Once the new systems are deployed, the focus shifts to the existing system. Many companies make a dry run, testing a few elements to be sure their plan is achievable. Typically, a company will get the new systems up and running and operate the old and new equipment in tandem for some time, allowing IT to roll back a change if a significant problem arises. Companies undertaking data center migration projects end up with a lot of old equipment that cannot simply be thrown away. Firms must create a detailed decommissioning and rebuilding plan that accounts for local health and safety procedures around electronic waste. In many cases, the systems will be repurposed in some way. Since confidential corporate data sat on the drives and in memory, IT organizations must ensure that information is wiped clean, so no one else can access it. It is imperative that the data center manager updates processes, procedures and documentation once the migration is complete. The new system will not function as the old one did, so staff need time to familiarize themselves. Hold a training session or sessions shortly after the migration to ensure the staff doesn’t revert to old, familiar processes that don’t suit the new data center setup. Given businesses’ reliance on IT systems and the number of possible problems that could arise, migrations cause IT managers a great deal of consternation. With a data center migration checklist and game plan, managers can lessen the likelihood of problems arising and, when they do, can deal with problems without getting off track. Paul Korzeniowski is a freelance writer who specializes in data center issues. He has been writing about technology for two decades, is based in Sudbury, Mass., and can be reached at paulkorzen@aol.com. Not every IT infrastructure project needs to be a time-consuming, capital-intensive, paradigm-shifting corporate initiative. Quick and easy updates significantly benefit data center facilities and IT performance, and act as a training ground for new employees. Strategic memory and local disk upgrades give servers quick and easy performance or capacity boosts. Memory is a limiting resource in virtualization, and servers rarely come with a full complement onboard. Inventory unused slots and add memory to assist existing VMs or accommodate future server consolidation. Solid state drives (SSD) are a local disk storage upgrade for strategic servers. SSDs improve I/O and lower latency, ideal for workloads sensitive to storage bandwidth. SSDs can accelerate performance if a server’s workloads rely on disk caching. Rather than rip and replace all the disk drives, add an SSD to a server’s local storage to clear bottlenecks and stop errors. People tend to forget that when the physical network gear is upgraded, your cabling may not be taking full advantage. Server firmware upgrades are fast and free, but also disruptive. Only perform them to fix specific problems like hardware or operating system support. Check your asset management inventory and get a list of the current server models and firmware versions, and then check the server vendors’ download sites for updates. Ascertain via the details or release notes whether the update actually solves a problem for you. Peripheral interface and adapter devices also have firmware that may need updates. Memory and disk upgrades pose downtime (unless hot plugging) and re-racking issues. “RAM upgrades are cheap and effective, but … it’s not exactly an ‘in place’ upgrade,” said Pete Sclafani, COO and co-founder of 6connect, a network automation solutions provider in San Francisco. Perform memory and SSD upgrades during scheduled server downtime. Disk capacity is expensive, and you can forestall major capacity additions by removing unnecessary content or migrating data to lower storage tiers. For example, temporary directories flood with unneeded data, so clear out /tmp and c:/temp directories in servers and storage subsystems. Try a zero byte reclaim for thin storage deployments. “Write zeros to all allocated but unused space,” said Tim Noble, director of IT operations at ReachIPS, a cloud platform provider in Anaheim Hills, Calif. A zero byte reclaim of the server’s allocated, never needed storage frees up space on the array. As network bandwidth reaches 10 Gigabit Ethernet (GigE), 25 GigE and faster, aging Category (Cat) 5 and 5e copper cabling infrastructure for 1 GigE is unable to cope with the new data center requirements. In some cases, the right hardware is in place for higher bandwidth networks, but the cabling is not. “People tend to forget that when the physical network gear is upgraded, your cabling may not be taking full advantage,” Sclafani said. Don’t rip out aging cabling all at once; Ethernet cabling is fully backward-compatible. Make relatively small, incremental investments in faster cables as time and money allow. Servers will remain on 10 GigE for the foreseeable future, so focus on network backbones, especially Ethernet-based iSCSI and Fibre Channel over Ethernet storage arrays. For example, Cat 6 cables can support 10 GigE to 55 meters while Cat 6a and Cat 7 cables can handle 10 GigE to 100 meters, without requiring new network adapters, switches or other components. Long distances — and 40 GigE+ Ethernet bandwidths — need expensive optical fiber media and specialized skills to splice and integrate, which entail a formal capital upgrade project. Differentiate the new cables from older twisted-pair lines with colored jackets or another labeling scheme. Clearly duplicate markings or labels for patch panels. If you can’t measure it, you can’t manage it. Data center infrastructure management (DCIM) tools monitor the electrical and environmental behaviors of complex facilities. DCIM requires a proliferation of sensors placed strategically around the data center. These tools may trigger automated responses to situational events, such as migrating workloads when a server becomes too hot, or sounding an alert when moisture suggests a cooling loop leak. Missing or inadequate sensors can leave input gaps. Temperature sensors locate hot spots within racks and rows. Humidity sensors warn of excessively dry air or damaging condensation levels. Moisture (liquid) sensors are essential when chilled water circulates in heat exchangers or rack doors. Power monitors track energy use in real time. Air flow sensors ensure that fans are running and filters are unclogged. Motion detectors spot unauthorized intruders and trigger security alerts and cameras. Smoke/fire sensors protect valuable assets and lives. RFID tags help automate hardware inventory control. New sensors are quick and non-invasive installs, done in small increments to keep cost and time commitments minimal. OS and application security updates might seem obvious, but these low-level tasks get postponed by day-to-day firefighting and complex data center projects. Hypervisor updates, such moving to VMware vSphere 6, are rarer and might be delayed by testing. Check the hardware and software inventory of your virtualized servers to verify that they support the new requirements, and finish lab testing so the new features can move to production. “You might also simply update the VMware Tools on all of your hosts to [your current ESXi version],” Noble said. Look for other security enhancements: Check and fix file permissions, scour Active Directory user accounts for old or inaccurate entries and so on. These activities pose little risk to operating services. Modern data centers are process-driven — policies and procedures reduce errors and ensure consistent results regardless of who performs the work. As more IT departments move beyond script-based automation (such as PowerShell) to embrace sophisticated workflow automation tools, it’s easy to forget the actual steps and why they’re there. Roles and priorities change, opening strategic opportunities to review, streamline and optimize workflows. Perform a fire drill to verify that existing infrastructure works as expected. This is particularly important with disaster recovery (DR) and resilient systems such as server clusters. Test server failover in active/passive clusters or simulate the loss of a server in active/active configurations. “If you have a DR site, a weekend of maintenance in one data center might be a good time to test operations in your alternate data center,” Noble said. Unacceptable service disruptions indicate additional remediation work to meet the data center’s requirements before real trouble strikes.